Seeing the reporter from last season reminded me of a crucial evolution of the show between now and then – last year overemphasized Leslie’s awkwardness and self-delusion, whilst this year shows her as somebody who is genuinely excellent at her job and cares about performing it well, even when other government people are willing to coast by. 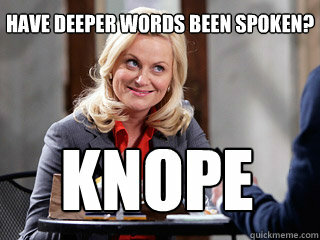 She may take it also seriously, but I’m glad there are Leslie Knopes working for us. Conversely, production might be delayed like when Amy Poehler became pregnant throughout the third season of Parks and Recreation.